I Cannot Tell a Lie , by Shana Berger and Nathan Purath, is a single channel video that explores American mythology by reenacting the fable of George Washington and the cherry tree. Washington's act of immorality, cutting down his father's beloved cherry tree, was redeemed by his mythical act of morality, courageously admitting his deed in the end. For this, Washington won his father's praise, who said his honesty was "worth more than a thousand trees." 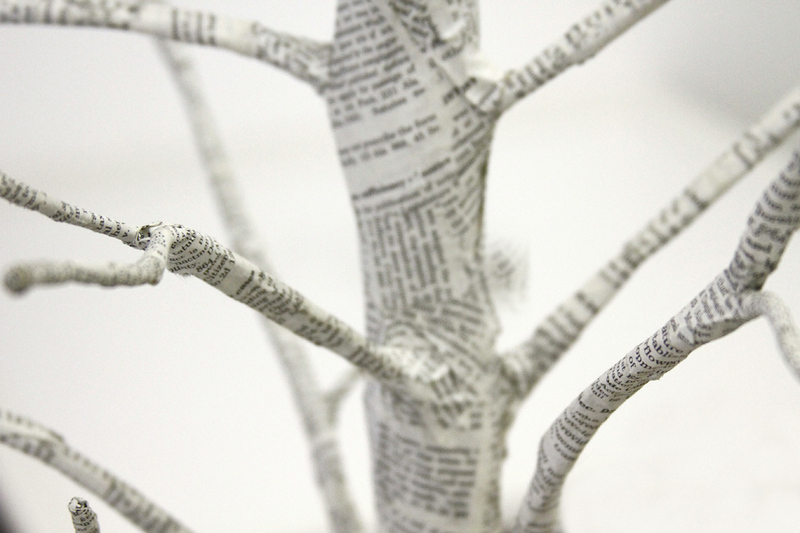 The featured tree is made from pages of the 1901 Alabama State Constitution. 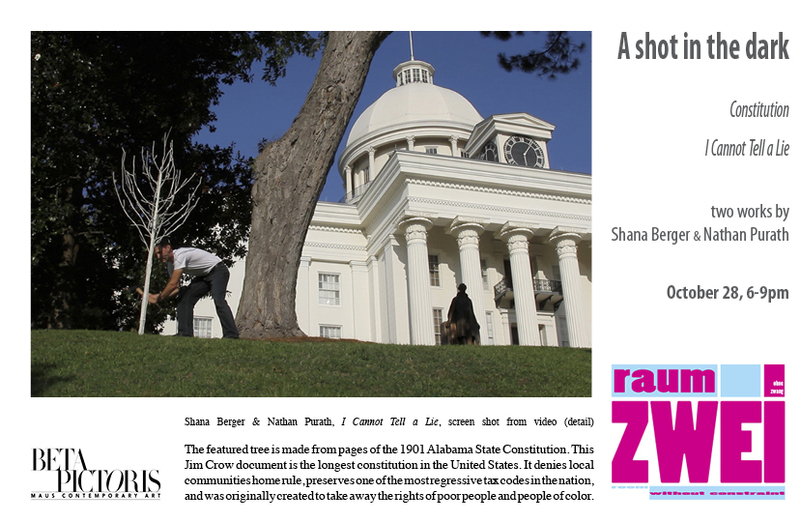 This Jim Crow document is the longest constitution in the United States. It denies local communities home rule, preserves one of the most regressive tax codes in the nation, and was originally created to take away the rights of poor people and people of color. 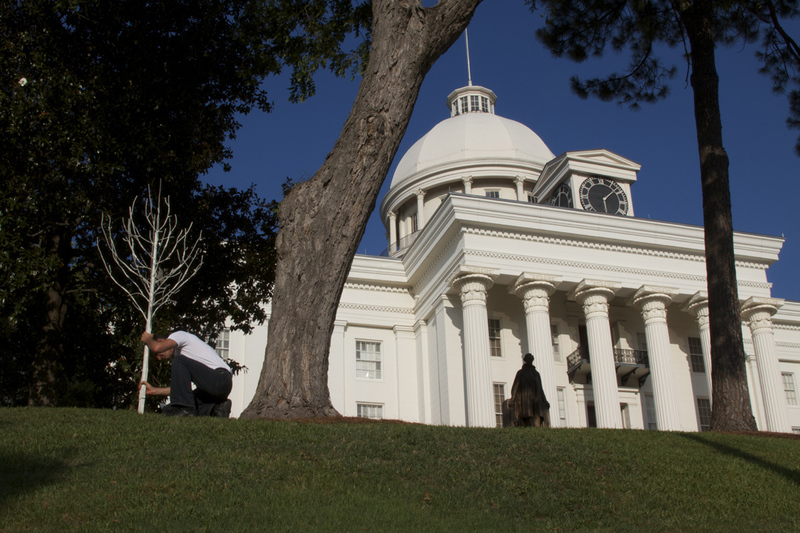 The I Cannot Tell a Lie tree was planted on the lawn of the Alabama State House, feet away from the marked spot where Jefferson Davis was sworn in as the first President of the Confederacy, and across the street from the Dexter Avenue Baptist Church where Martin Luther King Jr. and Montgomery citizens planned and implemented the Montgomery bus boycotts. The site embodies departing models of civil disobedience, and reveals the inherent irony and contradiction in American mythology. 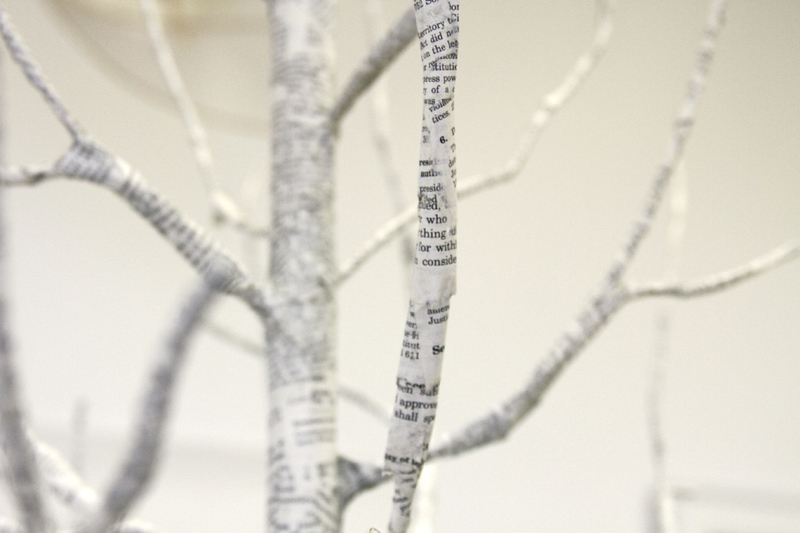 The cherry tree myth remains a popular childhood fable, though it is commonly known as a fiction. George Washington was a complex character. He is said to have opposed the institution of slavery after the American Revolution, but owned slaves. He protected the rights of slave owners, but is the only founding father to emancipate his slaves upon his death. Where does the myth of truth telling fall within these historical narratives? I Cannot Tell a Lie presents a great American contradiction-that the mythology of our nation asks us as to overcome the injustices that were born from its inception. 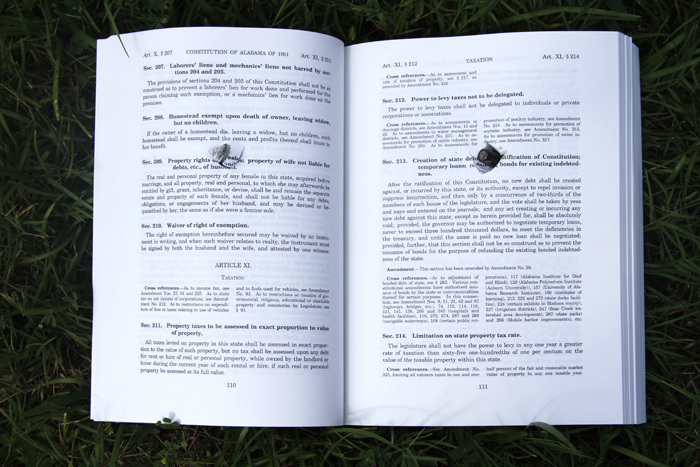 The work Constitution consists of a 1901 Alabama State Constitution (2001 Centennial Edition), shot at point-blank range with a .38 caliber revolver, the standard issue police weapon circa 1960s. 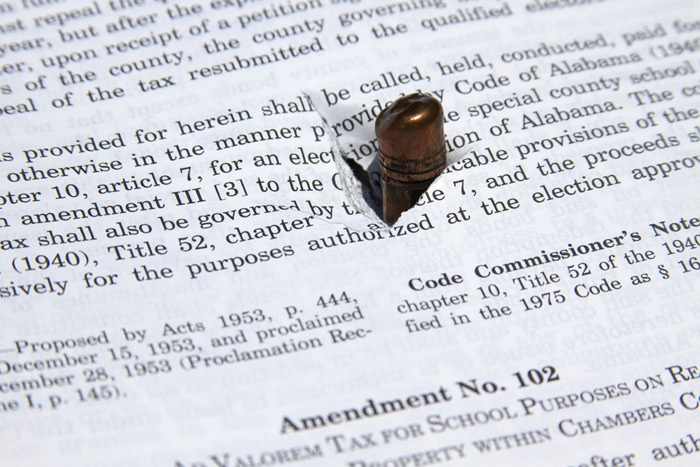 The Alabama Constitution is so thick, it stops the bullet circa midway through!